To mark the start of Lent, Rev. 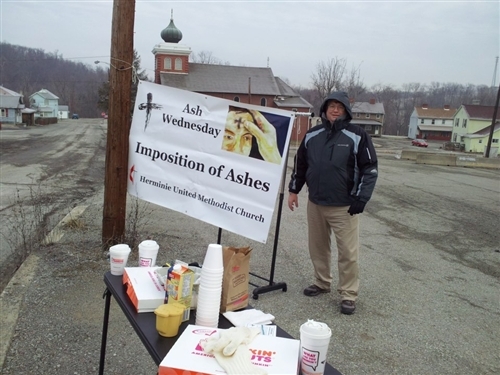 Larry Dunn and Lay Leader Carol Diemert of Herminie United Methodist Church took to the streets from 7 a.m. to 9:30 a.m. on March 5 offering imposition of ashes to anyone who wanted to receive the Ash Wednesday sign of mortality and repentance. They were at the corner of Pike St. and Sewickley Ave. in Herminie. "This gives people the opportunity to begin their Lenten season on the way to work. It also gives us the opportunity to be out in the community sharing the beginning of our Lenten journey together." he said. It's the second year in a row that the pastor and lay leader will offer the "drive-through" service. “The reaction was great (last year),” Dunn said. About 25 or 30 people stopped. The receiving of ashes has a long tradition in the Christian church. It marks the start of a season when many prepare for Easter through penitence,fasting, moderation and spiritual discipline. "More and more, we are taking things out of the church building and into the community where we serve to show the people of Herminie and the surrounding area that we are here to minister to all people's needs, not just the needs of those who come through our doors,” Dunn explained. Other pastors and churches also offer ashes outside their church buildings. In northern New Jersey, the Rev. Chris Heckert, a Western PA native who is pastor of Morrow Memorial UMC, joined colleagues offering ashes at a commuter train station Ash Wednesday morning. In Springfield, MO, last year, the Rev. Yvi Martin set up shop at a coffee house near her church from 6-10:30 a.m. for anyone who wanted to begin their day with prayer and the marking of ashes. It brought about 75 people into the coffee shop, making the owner happy. She described her experience in the Leading Ideas newsletter from the Lewis Center for Church Leadership. In a little town of West Michigan, June M. Marshall Smith said she was a person who would wrinkle her nose at the idea of a church doing drive-through ashes -- until she tried it last year. It was well worth the effort, despite cold and long hours, she wrote in an article for the Detroit area website. She offers tips for those who want to try it. Find out when and why United Methodists began imposition of ashes on Ash Wednesday. Learn more and find resources for Lent and Easter.